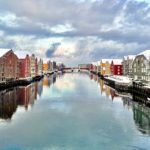 Looking for a low-budget escape from winter in Norway, I’m surprised to find that my best option seems to be a week in the United Arab Emirates. 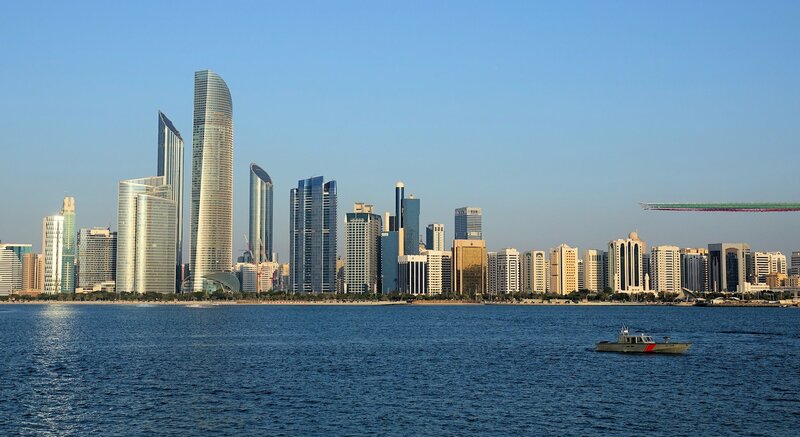 For just 350 US dollars per person, my wife and I can get round-trip tickets from Oslo, Norway to Dubai, and a room at an excellent hotel just outside Abu Dhabi (Radisson Blu Yas Island). Surely there’s a catch somewhere? To find out, we buy tickets and leave the next day. Our flight is great. It’s a regular Emirates flight. This airline regularly wins awards, and deservedly so. The seating is comfortable and the food is decent. There’s a huge choice of new movies to watch, with a large screen and quality headphones to enjoy them with. No struggle there. I almost wish the flight would be longer. The only inconvenient part is that we fly to Dubai airport. It would be better to fly straight to Abu Dhabi. Instead of a 15 minute ride to the hotel, it takes almost two hours to get there. Still, transfers between the airport and the hotel are included, so it’s not too bad. It’s late, so I talk a lot with the driver to keep him awake. 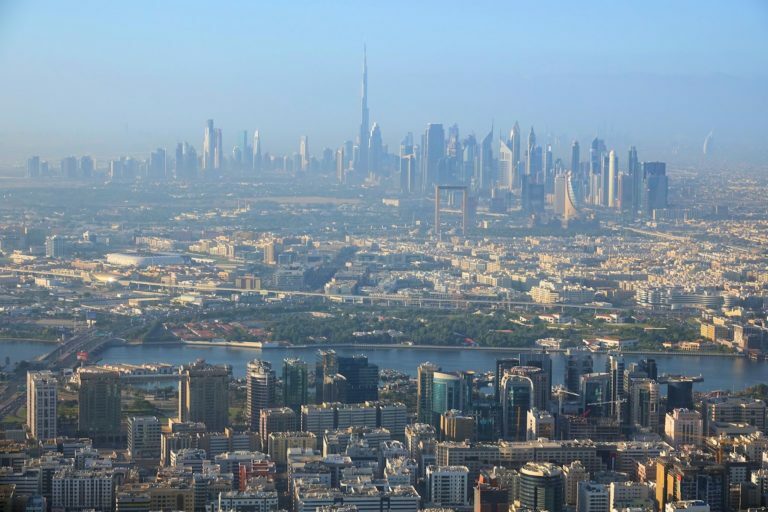 Like every service worker in this country, he’s not a citizen of the United Arab Emirates, yet he speaks enthusiastically about all the great marvels of Dubai. Soon a skyscraper a kilometer tall will be built. A shopping mall here is the largest in the world. Soon a new airport will open, and it will of course be the best in the world. And so on. Asking him to elaborate on the great places he tells us about, we understand that he lacks both the time and the money to visit them. He works a lot, and he sends all the money he makes back to his family in Pakistan, who he rarely sees. 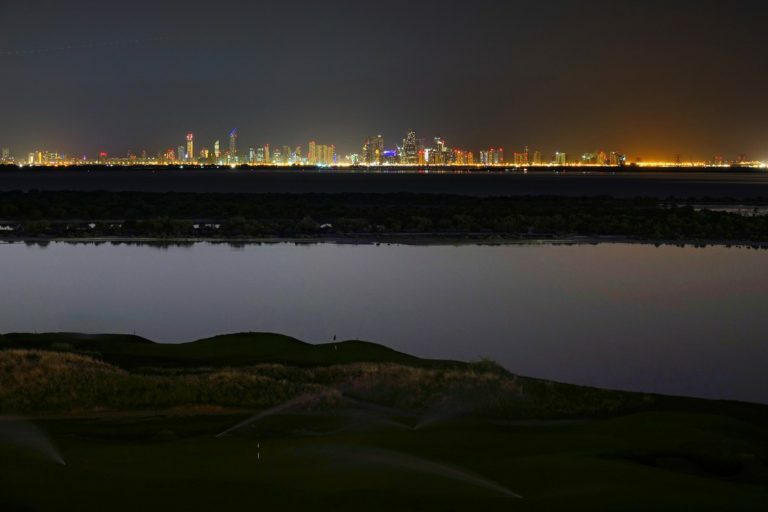 We may see more of the splendors of the Emirates during the week we’ll be here than he ever will. It doesn’t feel quite right. From our balcony on Yas Island we look across a golf course towards downtown Abu Dhabi. Many tourists will probably spend their whole vacation on this island. There are amusement parks, a beach, a giant shopping mall, and enough restaurants to last you a year. We’ll have some of that as well, but getting to the skyscrapers on the horizon is a priority. A quick morning walk on Yas Island says everything. This island is an illusion. 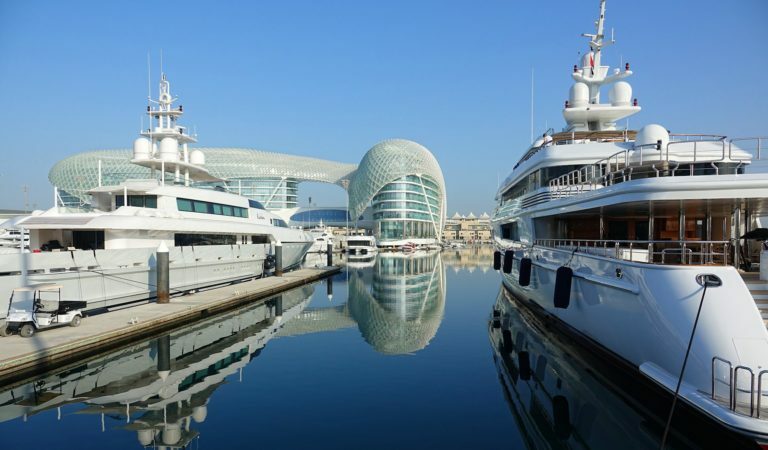 Ridiculously long and luxurious yachts lie side by side in the marina, and a futuristic-looking hotel straddles a Formula One course. 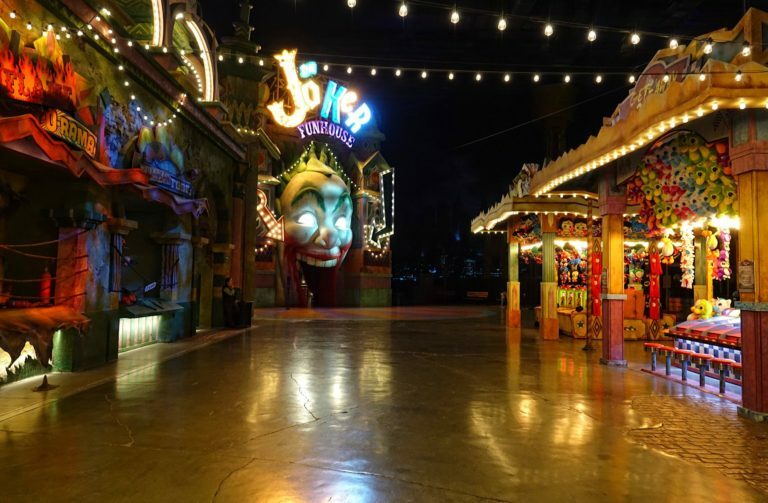 It’s probably a busy place during the week or so when the motor circus is in town, but now it’s all quiet. Leaving the island is hard, unless you’re willing to pay for it to be easy. 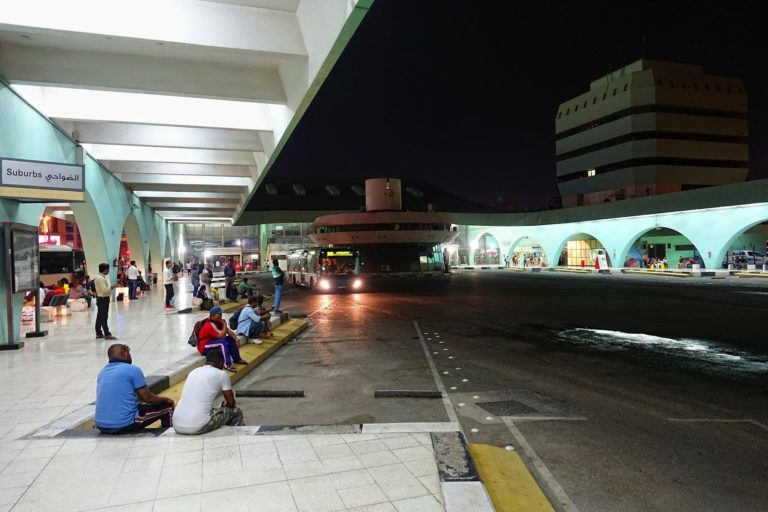 Instead of the long, expensive taxi ride to Abu Dhabi city, we go to the airport, where it’s possible to buy a bus pass. You can’t do that on Yas Island, although several buses go through there. And you’re not allowed to pay cash on any bus. The bus company will not trust their workers with handling money. It’s weird. With bus pass in hand, we take the A1 express to the city. We’re the only people on it, apart from the driver. I have a feeling that this country wants all tourists to go by taxi. At some random bus stop downtown that looks suitably busy, we get off. It’s a hundred years since the birth of the father of the nation, Sheikh Zayed. This is heavily advertised throughout the country. 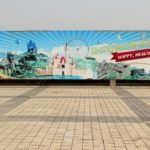 North Korea and Disney World are the only other places I’ve seen a dead former leader be celebrated as much as here. 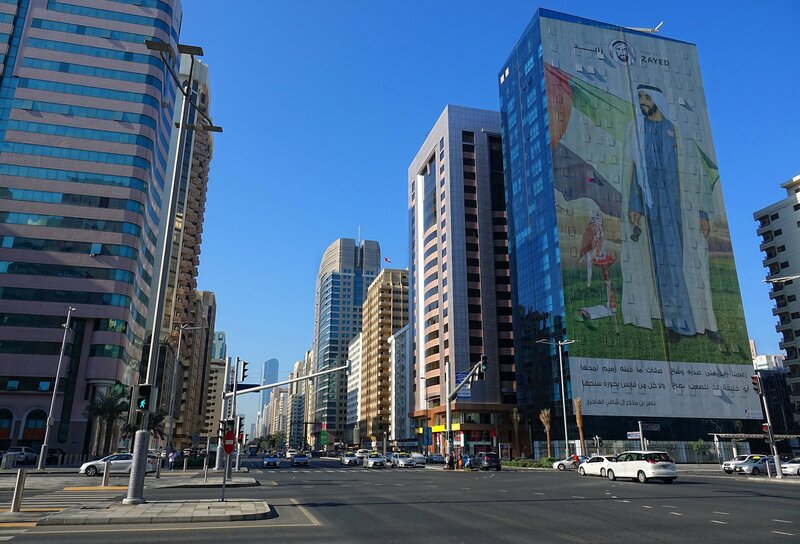 At first glance, the city seems vastly more like an actual city than the other places I have visited in this area; neighbouring Dubai, and Doha, Qatar. The tall buildings aren’t just for show. People live here, and there are all kinds of shops selling normal stuff that people actually need, not just luxury items. This makes the place vastly more interesting to me than the other two cities. 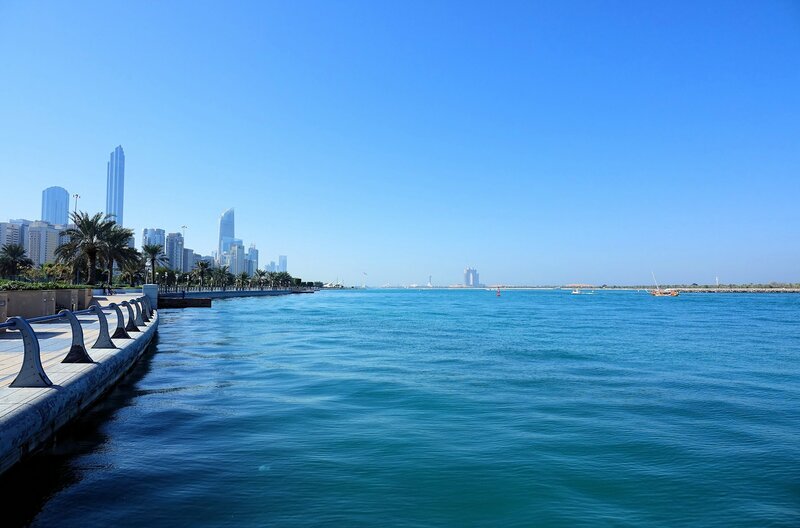 A pleasant way to get to know Abu Dhabi is by walking along the Corniche, a series of waterfront parks that offer shade, drinking water and nice views. We soon find Russians. After Indians, Brits and Chinese, the Russians are the fourth most numerous tourists in the UAE. And they’re so easy to spot. They’re the ones who will not lie down on the beach to get a tan. Instead they stand, slowly turning, to get an even burn all over the body. Usually they also wear funny hats and bathing suits with floral patterns. The Corniche trail takes us past several municipality motivational posters. “Air-drying laundry on balconies is an eyesore”, they say. In defense of air-drying, no laundry needs more than fifteen minutes in the sun here to be ready for the closet. Then you have “Your commitment towards using waste bins reflects your civilized manner”. I would say that so does the government’s official standing on basic human rights. Maybe start with the big things first? Finally, my favorite is where the municipality demonstrates its complete lack of understanding of what a clean environment involves; “Looking after your car is a way of committing to a cleaner environment”. Yes. Dirty cars is clearly the main environmental issue when it comes to cars. Speaking about cars, I love this scene. The Abu Dhabi Marathon takes place today, and here’s the guy that eventually will finish in last place. He is exhausted, and followed by hundreds of cars stuck at his glacial pace the last few K’s of the race. One of the main roads has been closed for hours for the marathon, but they’re opening it up as soon as they can. 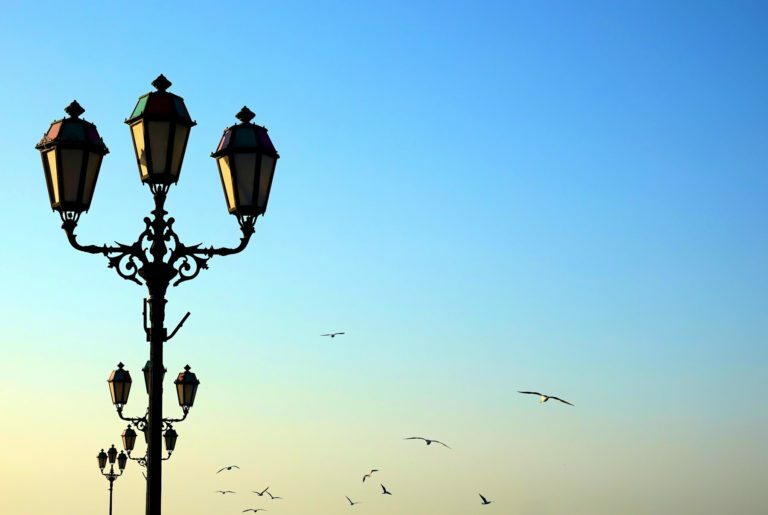 At the west end of the Corniche we see this. 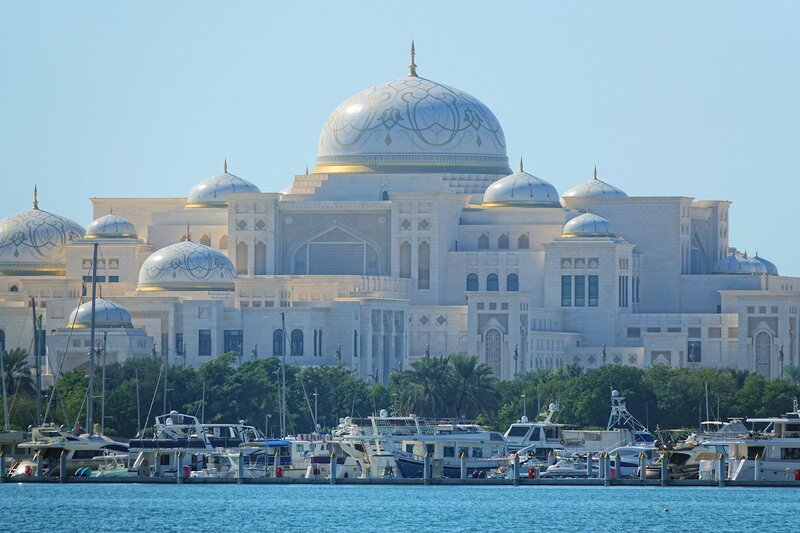 It looks like a giant palace because it is; the Abu Dhabi Presidential Palace. It’s brand new, and built to impress. Only the leadership of the country and visiting dignitaries will ever get to see the insides of it, of course. If I were to guess, though, I’d wager good money on that it’s full of marble and gold. In building this place they didn’t go over budget, because they didn’t have one. 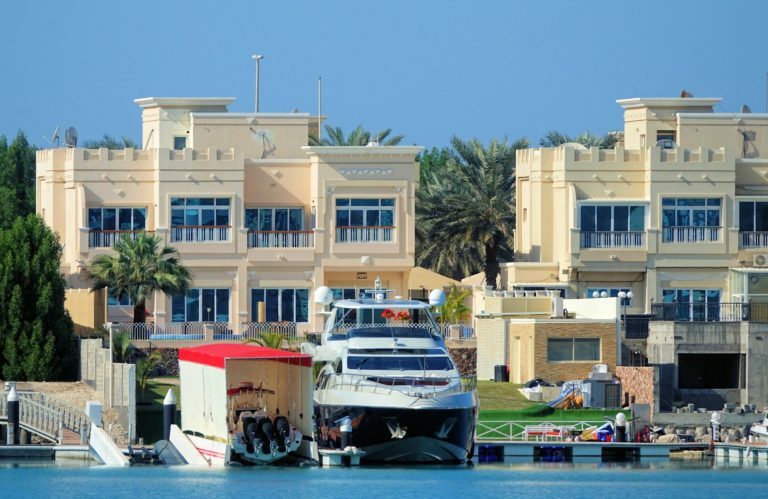 Across a bridge to the north we arrive at Marina Village on Al Kasir island. It’s the rich part of a rich city. There are embassies and offices of heart surgeons and plastic surgeons all over the place. 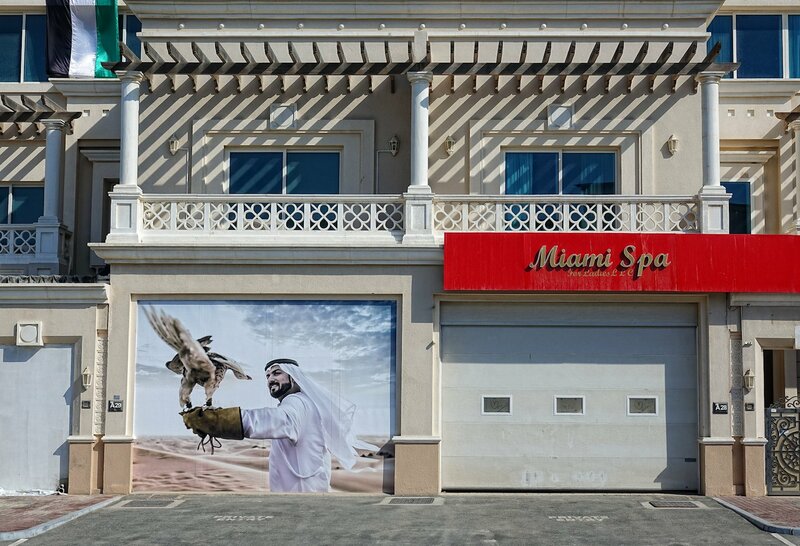 If you’re an endowed lady, you’ll be certain to go to Miami Spa to pamper yourself, and if you want to be a well-endowed lady, you head for the one of the clinics next door. Life is good if you live in Marina Village. You can even park a couple of your favorite boats/ships right at the end of your garden. Such convenience! 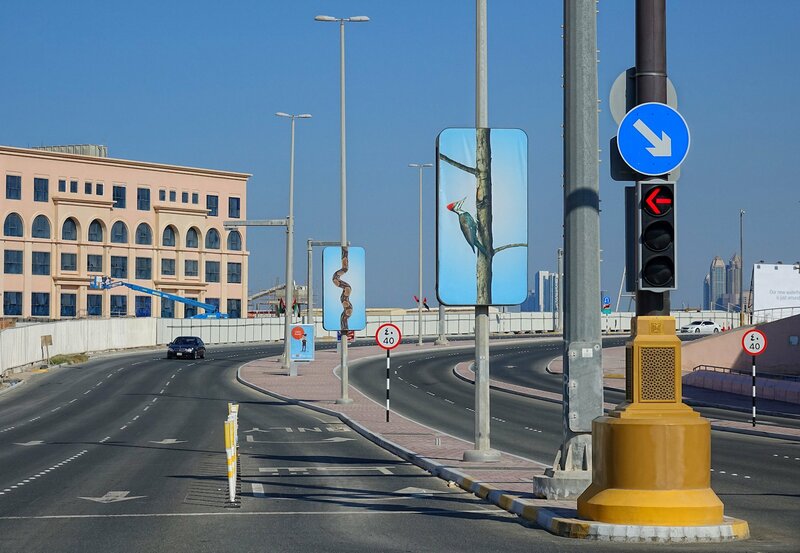 I like how the Emiratis disguise their light poles as nature. Inside the Marina Mall we take refuge from the heat. A mammoth seems to have had the same idea. 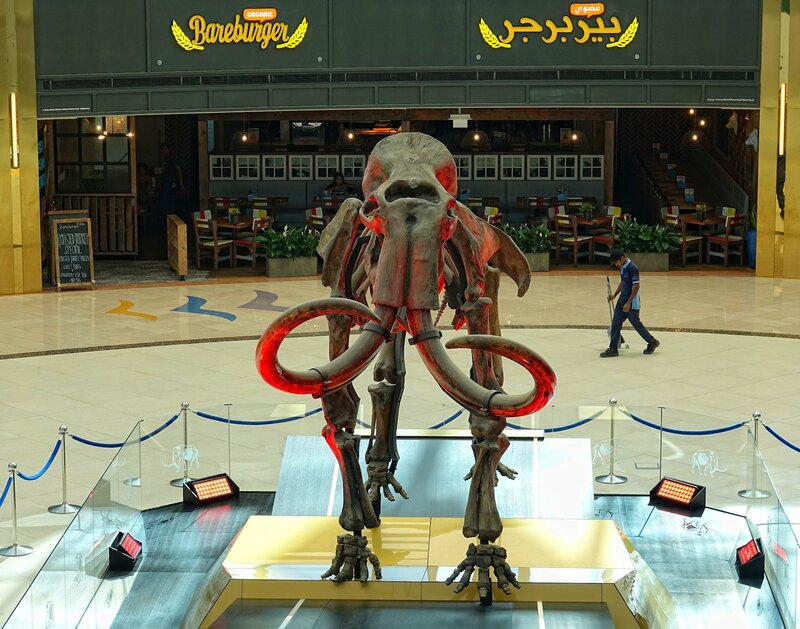 The display is advertised as a complete woolly mammoth, but it’s very naked and a bit on the skinny side, I think. People seem less interested in the mammoth than in the trampolines nearby. Priorities, people! 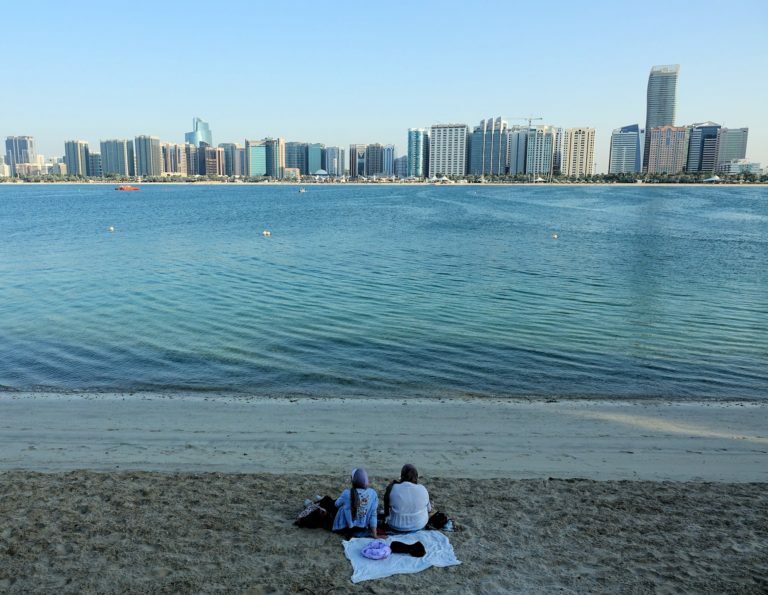 While half-naked tourists enjoy the sun along the Corniche, locals wear ALL the clothes in the shade on the opposite side of the bay, enjoying a picnic. The view is better from here anyway. The old-fashioned street lights along the Marina promenade are pretty. People come here to enjoy the view of them and the Abu Dhabi skyline, and apparently to feed the seagulls. In honor of members of the royal family who attend a boat race in the bay, the aerobatics team of the United Arab Emirates Air Force, Al Fursan, perform in the skies above Abu Dhabi. The jet fighters are heading straight for those skyscrapers over there. It doesn’t look completely safe to me. Surely they will make a turn any second now? But no. They keep on going, leaving a multi-colored smoke trail through the glass and concrete central business district of Abu Dhabi. It’s impressive, and a little bit frightening. Especially if you sit in your humble penthouse apartment looking out the window, and suddenly you see seven jet fighters whooshing by below you. Around the corner we leave the jet age. 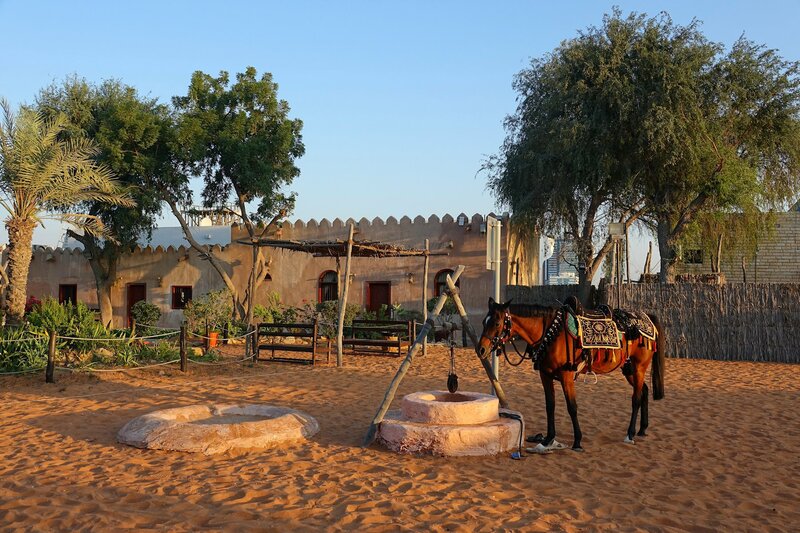 This is the Heritage Village, a free entrance open air museum where the traditional Emirati way of living is on display. This is quite unlike anything we’ve seen elsewhere in the country. There’s nothing “largest” or “best” about this, yet it seems a lot more cozy. And I have to say that the Arabian horse is way more elegant than any of the fancy cars the Arabs seem to prefer to use to get around these days. 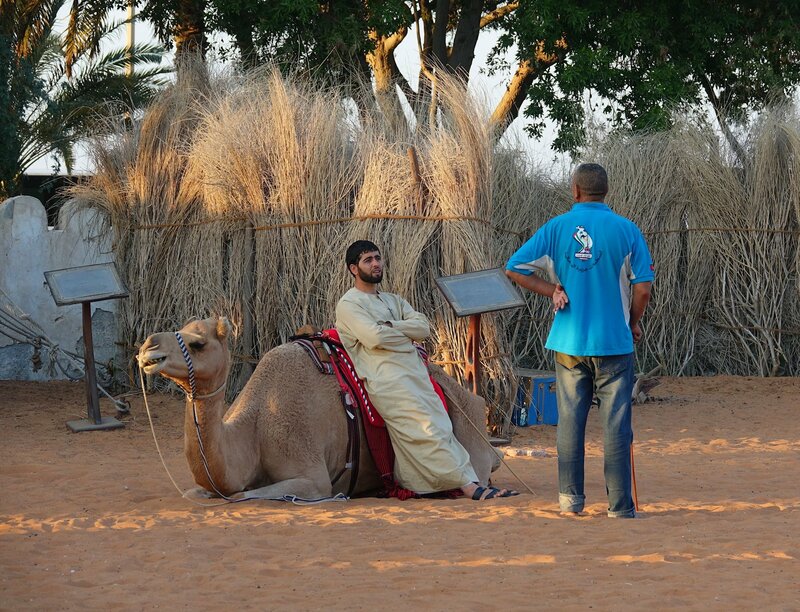 The only camel on the island seems relatively content with having just 100 square meters of desert to live in. 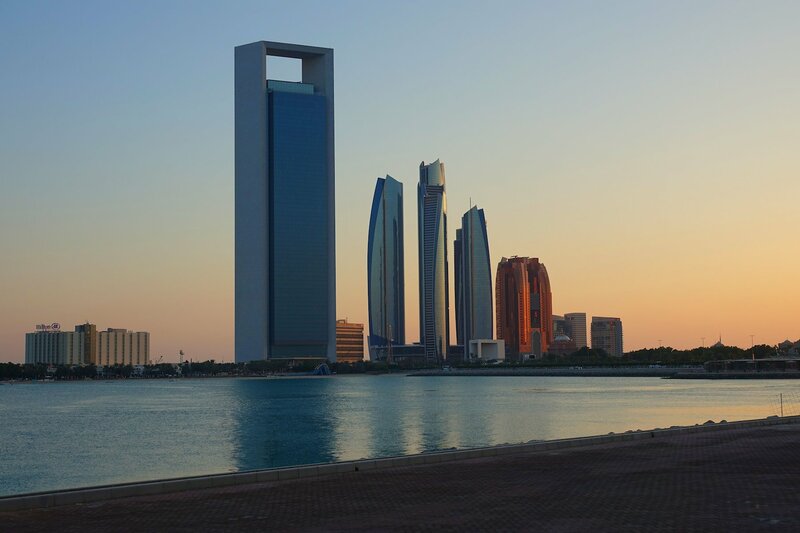 The cluster of skyscrapers around Etihad towers seem rather futuristic under a setting sun. I’d love to have seen this place a hundred years ago, and even more to see it as it will be one hundred years from now. I suspect those views may be more similar to each other than to this. We observe the sun go down behind the presidential palace from a bench in a park with fountains. 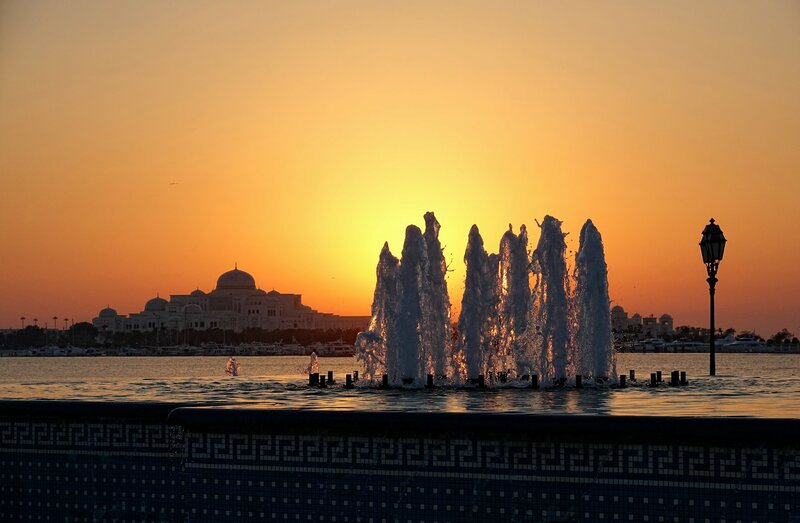 There are many fountains across Abu Dhabi. In an area with precious little fresh water to go around, having fountains is a particularly poignant display of money and power. As darkness falls, we leave the world of extreme luxury and head back to the Abu Dhabi bus terminal. For less than a dollar, we get to travel for an hour all the way back to Yas Island on an air-conditioned bus. Now this is my idea of what sufficient luxury should be like. After a good night’s sleep, we’re going to Italy. Or as close to Italy as we can get in the Arab world. 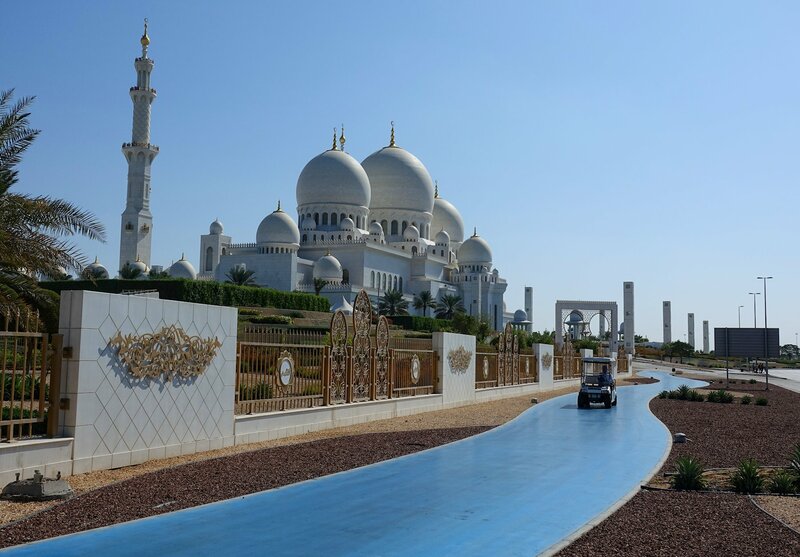 To attract visitors to Yas Island, the Abu Dhabi government paid good money to Ferrari for the rights to build an amusement park in their name, Ferrari World Abu Dhabi. Except for three rollercoasters, the whole park is indoors. This makes a lot of sense in an extremely hot climate. So here we are, enjoying Italian ice cream at an Italian sidewalk restaurant while being comfortably air-conditioned. And it’s all fake, of course. The Flying Aces rollercoaster is to me the most thrilling at Ferrari World. It’s short enough so that you don’t have time to get a sunburn before returning inside, but it’s still pretty scary. 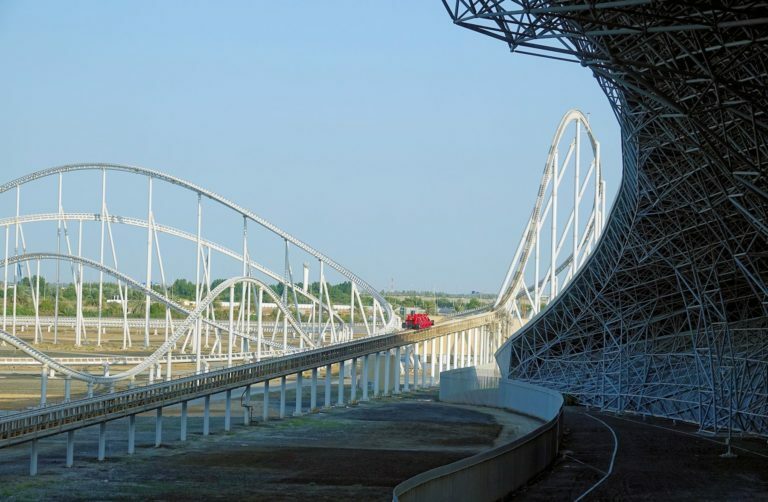 With 63 meters, it is the world’s tallest non-inverted loop. This means that while going really, really fast, you actually sit on the outside of a loop. Never before have I more expected to be flung off to a galaxy far, far away. But I survive. The relatively modest strapping arrangement is part of the reason why Flying Aces feels so scary. A basic thing around your hip is all that holds you in place. Judging by these flying faces, most people still find it adequate. 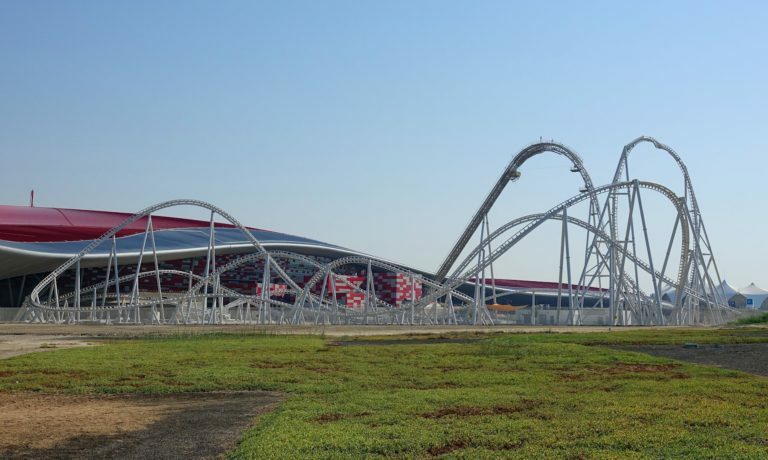 The big draw of Ferrari World is this rollercoaster, Formula Rossa. It looks fairly normal, but it’s the fastest in the world. 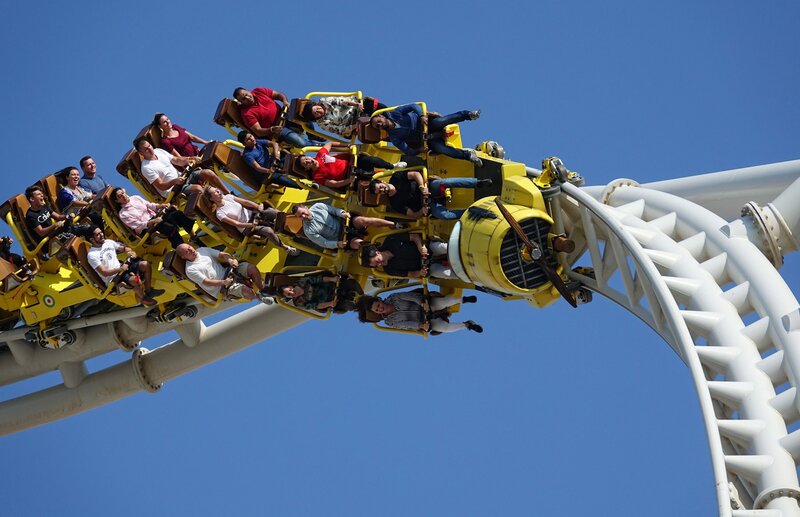 During the first five seconds of the ride, you are taken from 0 to 240 kilometers per hour. You feel that. The rest of the ride is straight-forward, but you spend it laughing hysterically while regaining control of your body. To avoid potential serious damage from having insects splatted against your eyes, all riders must wear protective glasses. It’s that wild. Ferrari World has many flashy cars on display. Some you can pay a fortune to sit and have your photo taken in. But I like this one the most. If I ever buy a Ferrari, it’s probably going to look something like this. Tired from riding rollercoasters all day, we walk back to the hotel. It takes about half an hour, and on our way we pass the Flying Aces, now standing outside the fence. It looks even more frightening in the dark. The ride starts with a climb up the steep hill on the right, before the cart rushes down the other side of the hill and straight into the loop you see on the left. We need a day of relaxation after the Ferrari stuff, so we head for the Sheikh Zayed Mosque. This mosque is one of few in the area that accept non-Muslim visitors, so it’s an obvious choice when we want to stalk the local beliefs. Again we travel by public bus. We can’t get all the way to the mosque entrance, so we have to walk a bit. After just one minute, this club car comes towards us. We’re pretty sure that we’ve committed some stupid infidel sin, so we brace for the worst. It turns out that the security guy thinks we’re crazy for walking hundreds of meters under a hot sun, and he offers to give us a lift to the entrance. 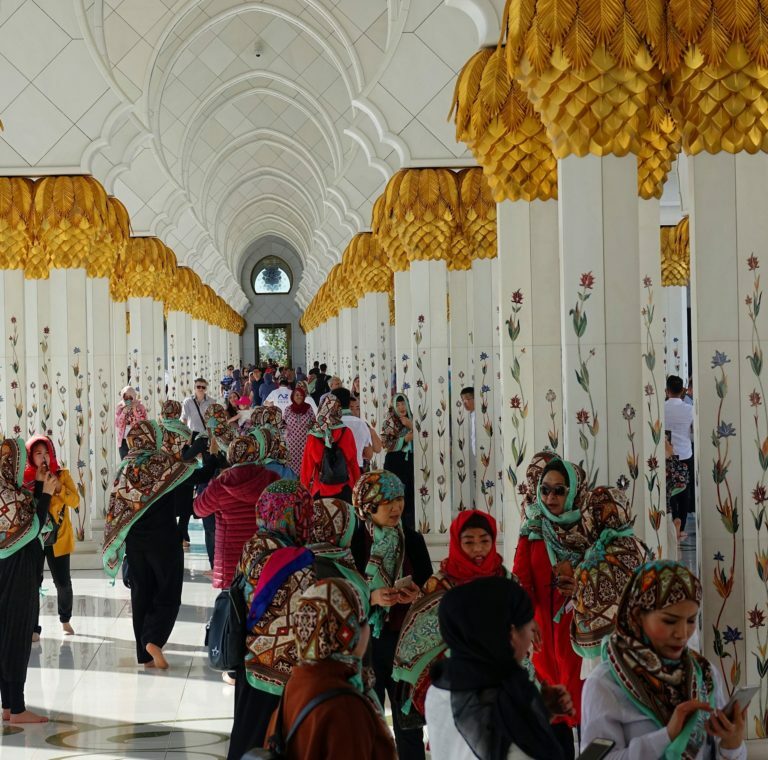 Beyond the entrance, we join a steady stream of tourists eager to learn about Islam, or at least to get some funny selfies of themselves in a mosque. 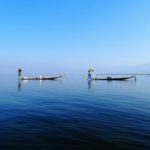 The Chinese currently hold the title “Most ignorant tourists on the planet”. They’ve done so for a while. 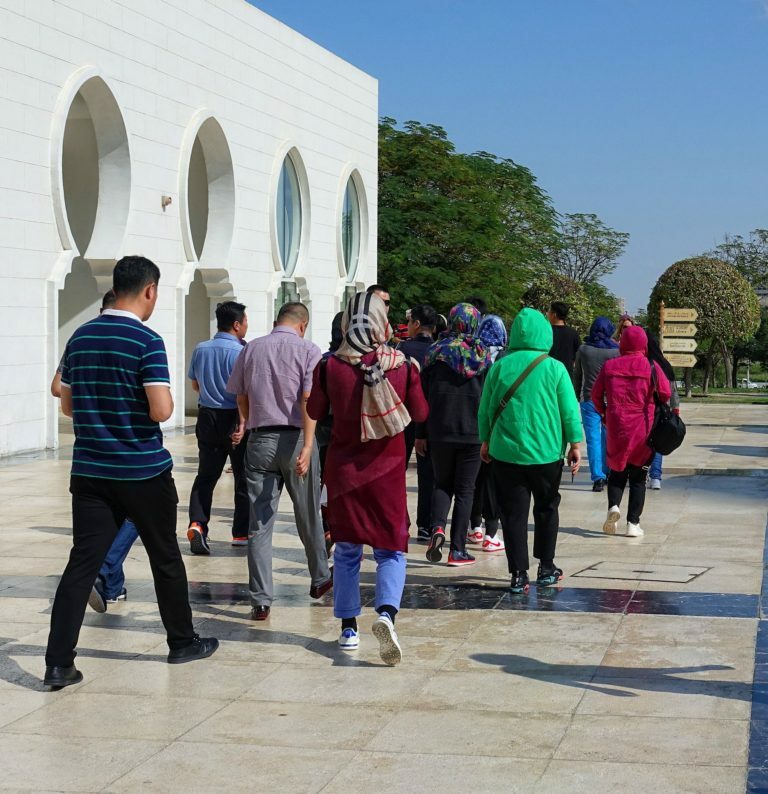 Where other tourists will borrow proper garments from the mosque, Chinese women just put on hooded windbreakers to comply with the requirement that women’s hair must be covered up. It’s amusing and obnoxious at the same time. The guards at the mosque just shrug. They know how to pick their fights. There are simply too many Chinese around, carrying too much money. 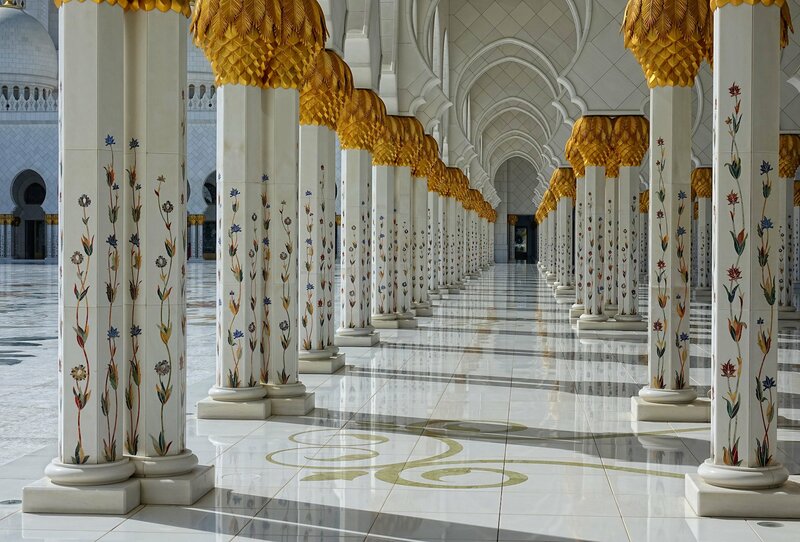 The mosque is large and shiny, no doubt about it, but I’m unable to admire or even like it very much. It’s just a few years old, and there’s a lot of bragging about how it is larger, better and more intricate than various other mosques. 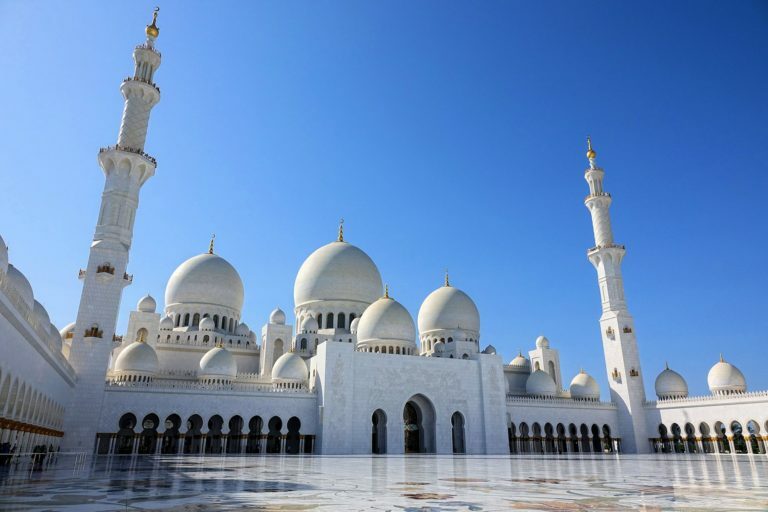 But those other mosques are many, many centuries older, and they come with so much history and, for lack of a better word, more soul than any modern building can match. What does impress me, though, is the large number of activities that not allowed at this mosque. Some of them I can understand what are. Not so sure about the funky one with the arrows. And what are the guys at the bottom left doing? Helping a drunk friend get home safely? Either way, Rihanna managed to be expelled from here for doing something bad, so we’re on our best behavior. Each flower on these columns is a complex mosaic of small, colored stones collected from all over the world. 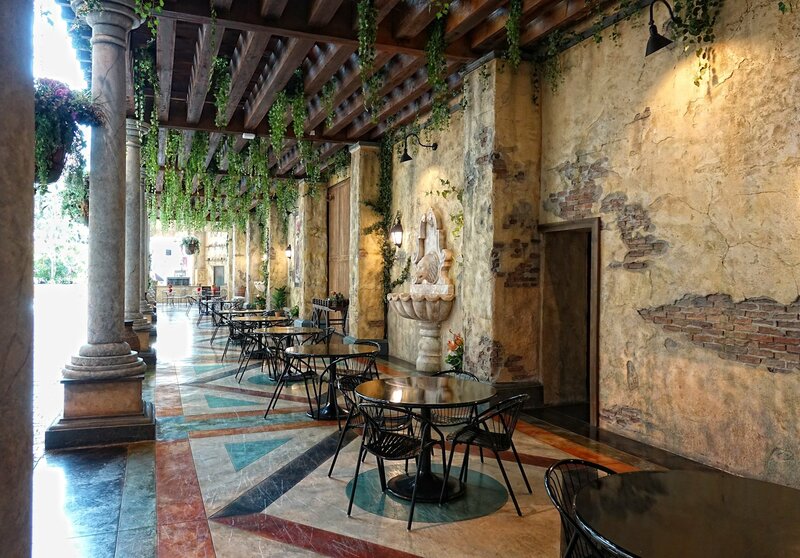 Natural marble comes in about 30 different colors, and the designer has used most of them here. Many of the man hours behind the erection of this mosque were spent making tiny stones fit together. The interior is of course no less exquisite than the exterior. The floor is covered by the world’s largest hand-knotted carpet. There are about 2,3 billions knots in it. Hand-made ones. Most of Iran worked for two years to pull off this feat. Seven imported giant chandeliers containing millions of Swarowski crystals hang from the ceiling. They’re so heavy that we are asked to please not walk under them. No god can guarantee the safety in a mosque of this grandeur, obviously. 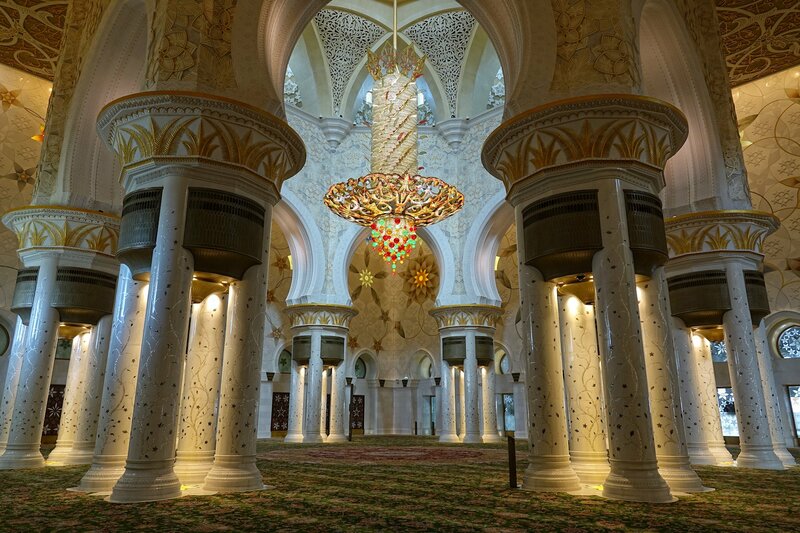 This is what it looks like in the part of the mosque that is open to visitors. Lots of borrowed hijabs, all worn by foreigners who keep inventing new ways to wear them. The Instagram is strong in these ones. 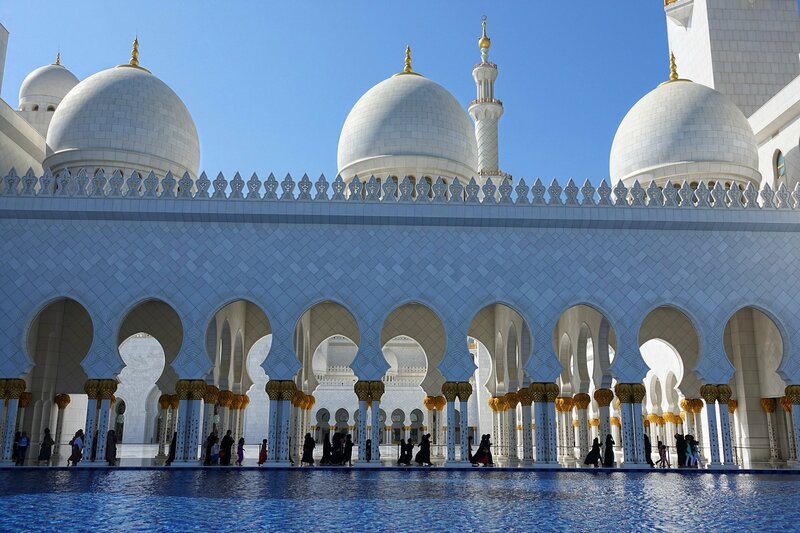 The large open courtyard in the mosque is filled by more than 30,000 worshipers during the holiest holidays of Islam. The rest of the year it’s just a no-go zone for tourists, thanks to the hard work from security guards at the mosque. Going out there is a good way to end up with a heat stroke, so it’s best to keep people away from it. After all the religious megalomania, we’re again ready for a day of amusement. 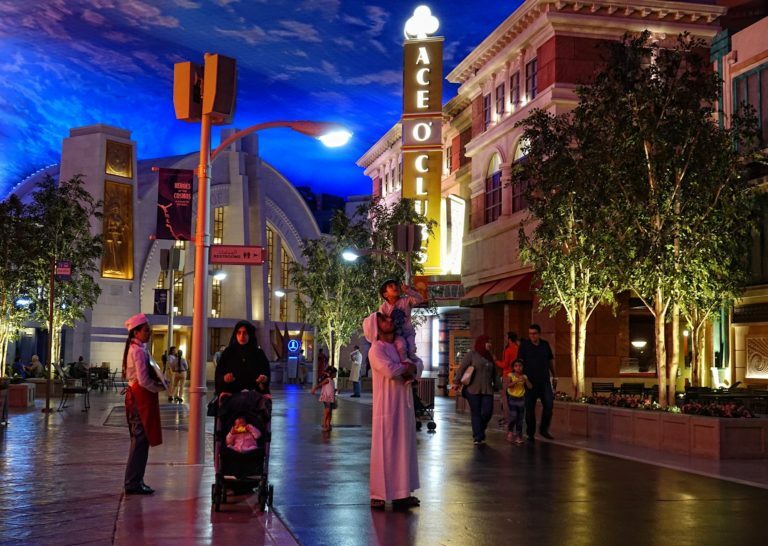 Back on Yas Island we visit Warner Bros World. It’s all indoors, so it should be quite tolerable. 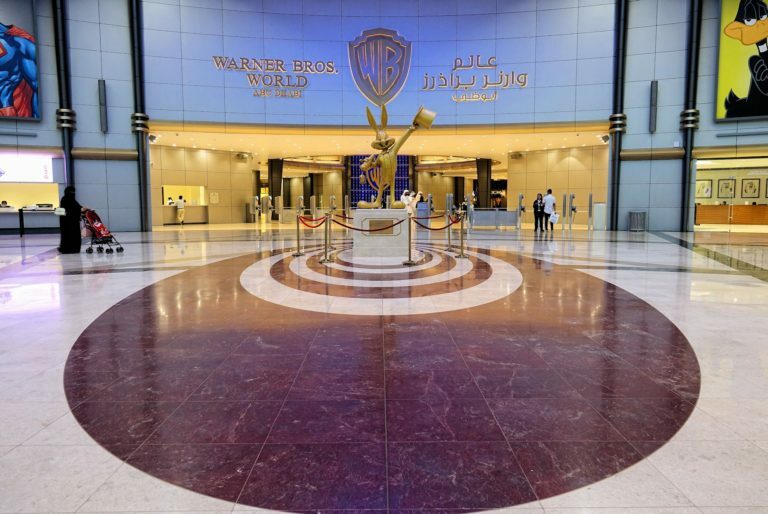 It’s another amusement park run by the local government, who has acquired the rights to use the Warner Bros brand in an attempt to attract more tourists. 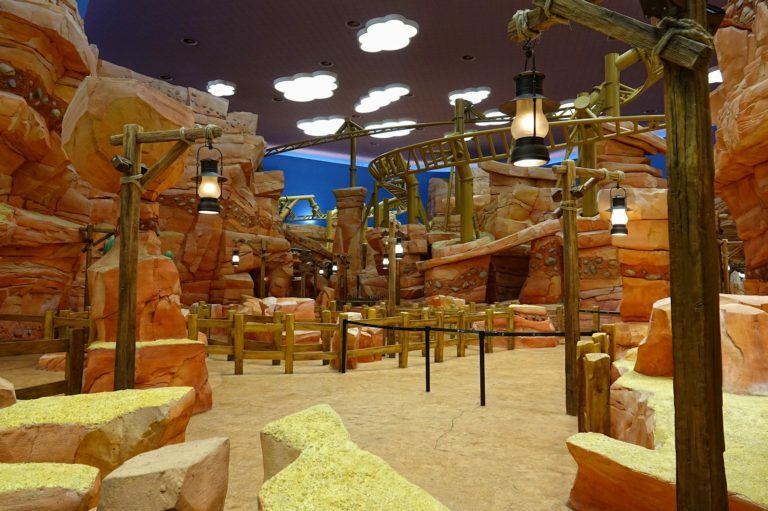 One of the sections at Warner Bros is Bedrock City. It’s not quite like being there, I think, but it’s surprisingly well done. 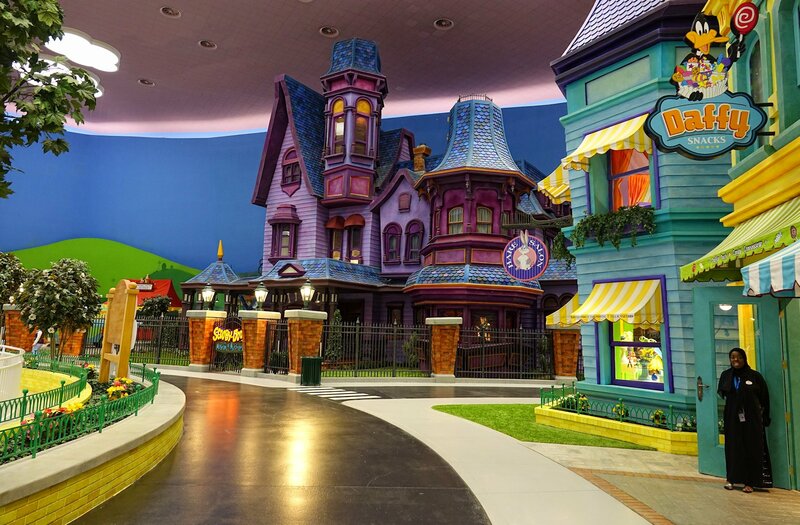 I would love this place if I was a kid. Except I guess that most kids these days have no idea who the Flintstones are. Warner Bros owns a lot of still strong brands, including highlights such as Harry Potter and Lord of the Rings. The rights for those were probably too expensive, even for the Emirates. 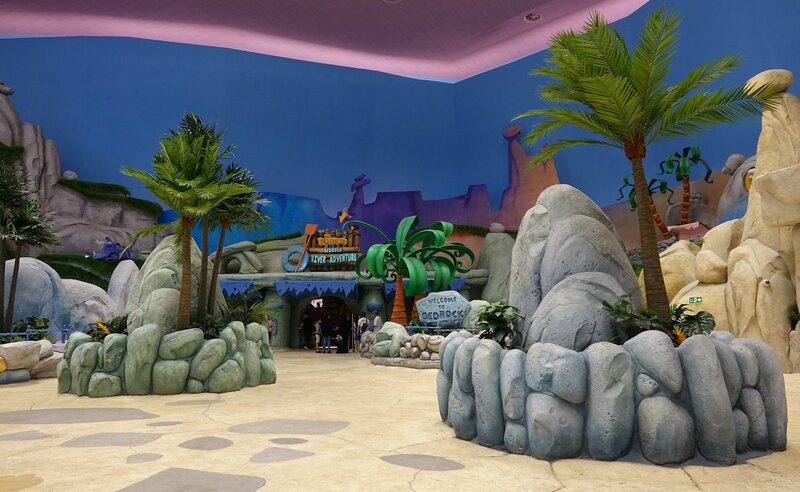 At Cartoon Junction we encounter even more ancient cartoon characters, such as Scooby-Doo, Bugs Bunny, Daffy, Wile E. Coyote and Road Runner. Every building here contains either a gift shop or some kind of ride or performance. 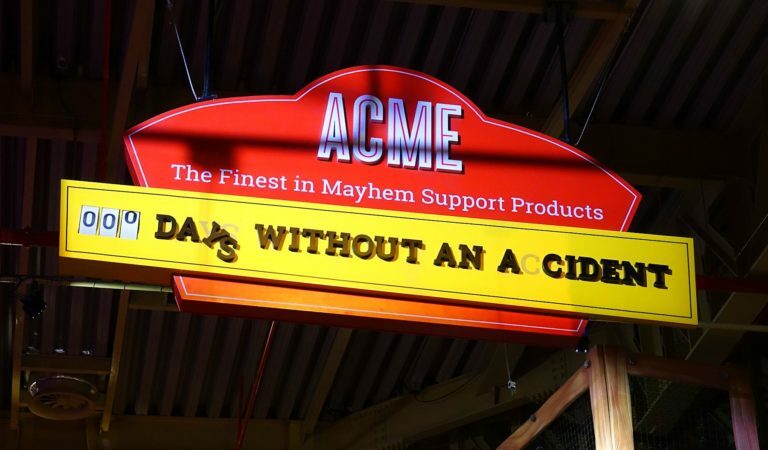 The place opened just a few months ago, and it shows. 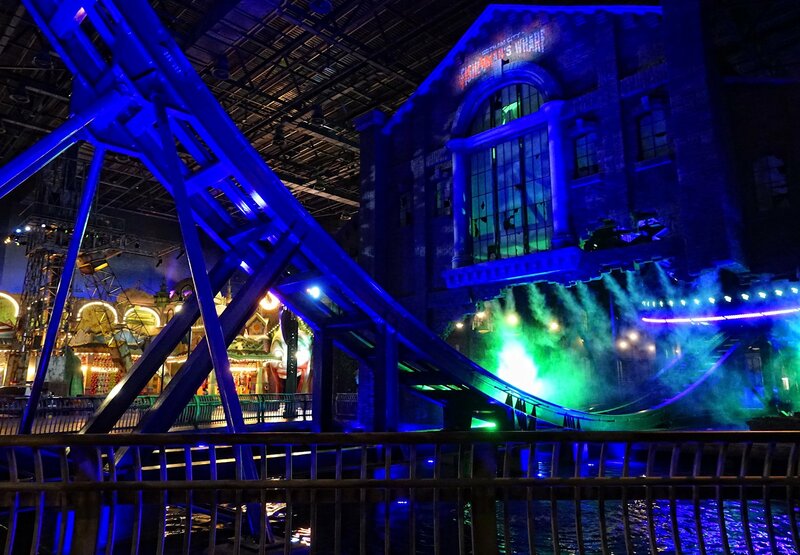 There’s a lot of modern technology used to help us have fun here, and it’s a refreshing alternative to the typical ageing displays at more established theme parks elsewhere in the world. 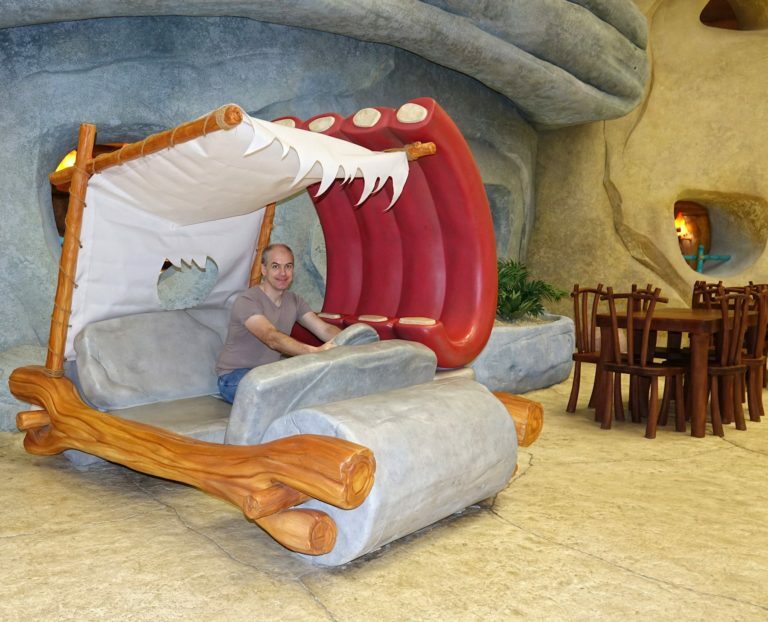 I finally got to test drive Fred Flintstone’s car, the famous footmobile. 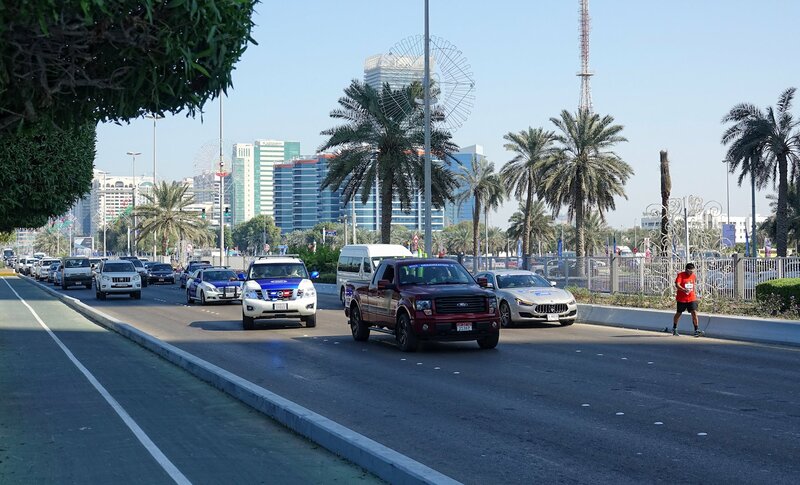 It’s the most environment-friendly vehicle in all of Abu Dhabi by far, I’m sure. The best ride at Warner Bros World is called “The Fast and Furry-ous”. 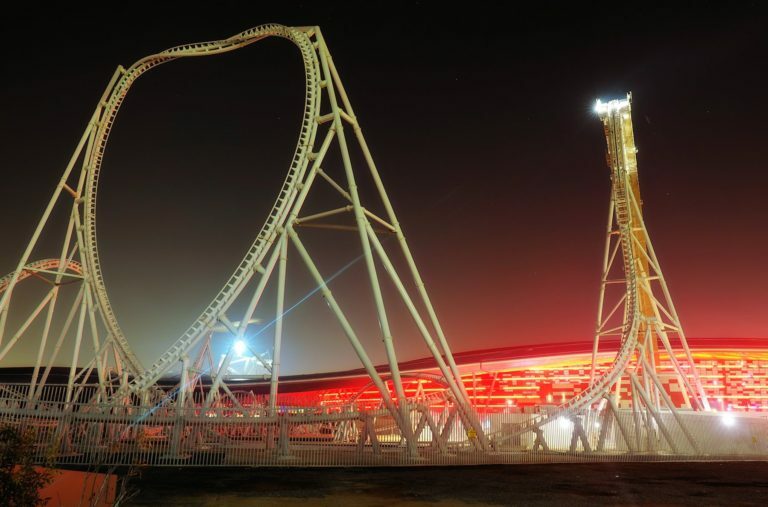 It’s an inverted rollercoaster, which means (you don’t sitg in a cart, you hang under one. I keep lifting my legs because I sense that if I don’t, my last ride of the day will be in a wheelchair. It’s great fun! The best part, as seen here, is that there’s no one in line to ride it! At least there isn’t today, on a normal weekday outside during low season. So we go on the ride several times in a row, and then we move on. It’s also possible that this sign is why there are so few visitors here, but let’s pretend it isn’t. Next up is Gotham City. Again, they’ve done a great job in creating the atmosphere of this fictional city. The almost complete lack of people also adds to the authentic intended gloom. Batman’s creator describes Gotham City as “Manhattan below Fourteenth Street at eleven minutes past midnight on the coldest night in November”. To build something like that in the Middle East isn’t easy. But they did it. “The Riddler Revolution” is another good ride. You sit at the edge of a disc that spins around. So far it sounds pretty average. But then they have the disc travel back and forth on a set of large, curvy rails. What can I say? The combination of moving back and forth and around and around at the same time is great for being reminded of what today’s breakfast tasted like. 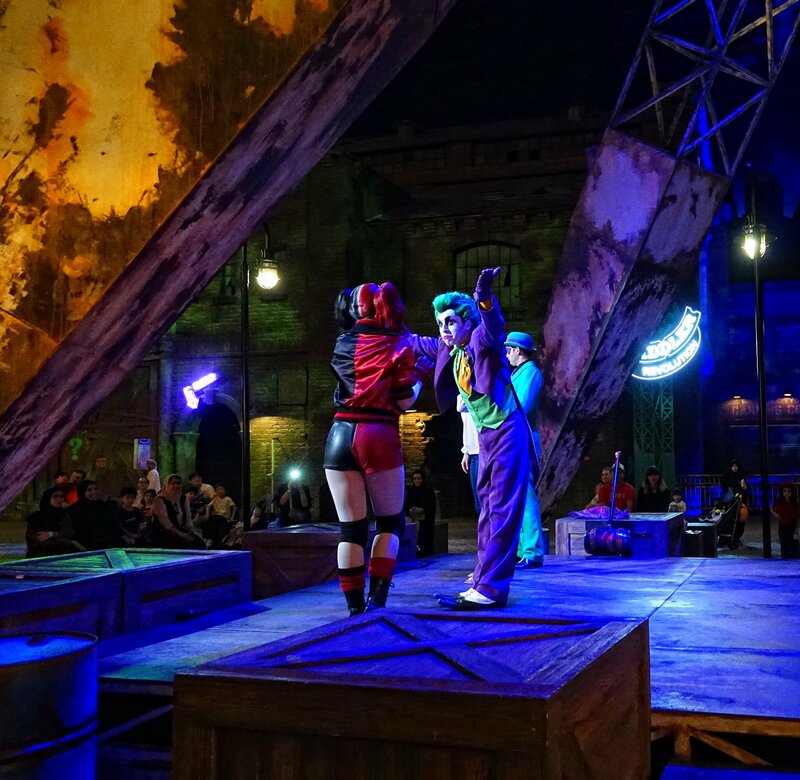 In addition to the rides at Warner Bros World, there are various pop-up shows and appearances by well-known characters from a wide range of movies. Here’s the Joker, the Riddle and Harley Quinn, cooking up some shenanigans for the benefit of the handful of visitors in Gotham City today. 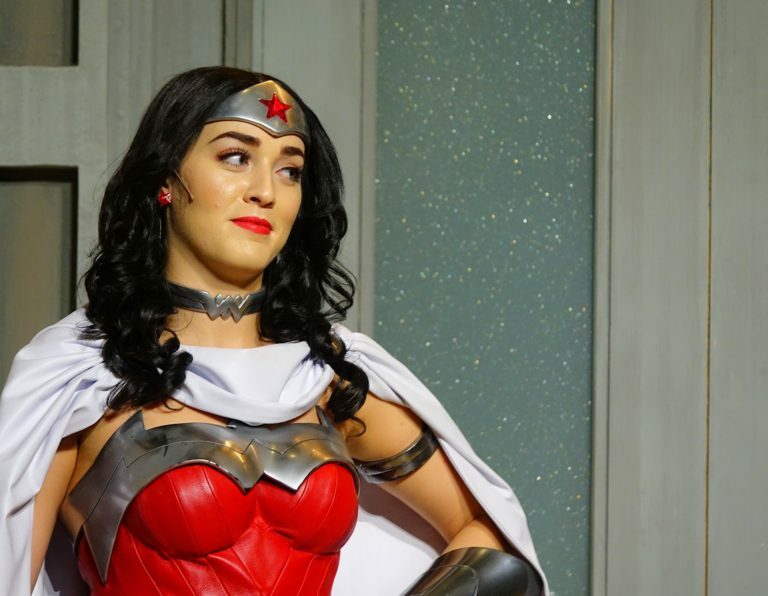 I’m pleased to see that the female superheroes among us have not been Middle-East-ified at all. Wonder Woman wears a tight top and some really short pants, and there’s a pretty spicy Cat Woman roaming the premises as well. 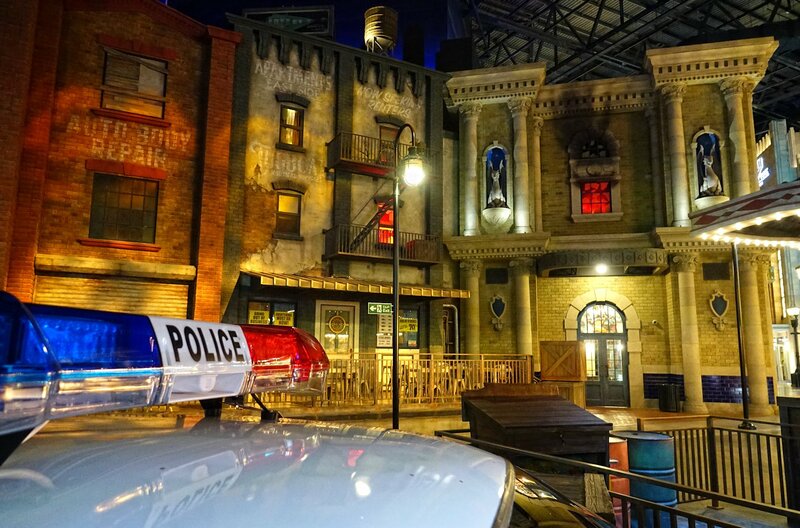 Here’s another shot from the streets of Gotham City. Notice the Gothic gargoyles observing us from above. Next door to Gotham City we have Metropolis, the domain of Superman. 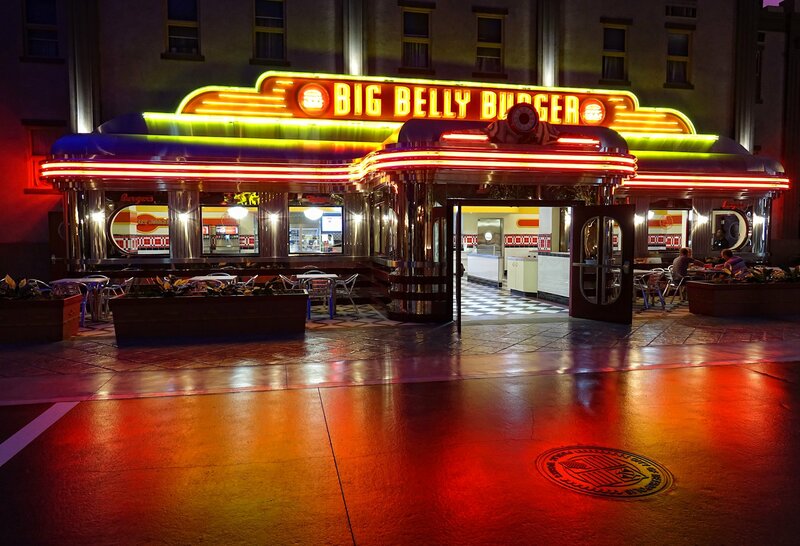 It looks good, although it completely lacks a waitress that will call you “Honey”. Instead they call you “Sir”, or “Madam”, like everywhere else in Abu Dhabi. I’d rather they didn’t. Late in the day, the number of visitors grows somewhat. I guess people come here after work, or they can’t be bothered to leave home during the hottest part of the day. Either way it’s refreshing, for once, to definitely be part of an ethnic minority in a relatively expensive amusement park. It’s been a long week in the United Arab Emirates. We’ve seen and done most of what we hoped for, and it has actually been a better than expected experience. 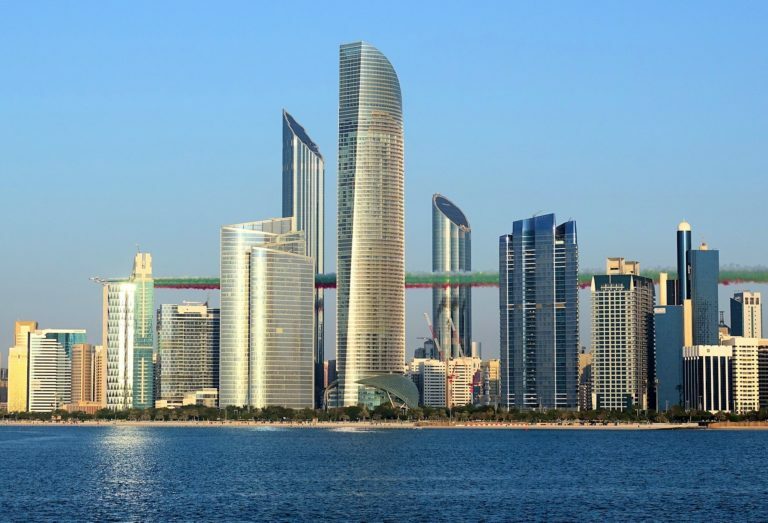 There are obviously issues with how cities are built and run on the Arabian Peninsula, but Abu Dhabi is certainly not the worst example. That dishonor goes to Dubai. And we have to go through there to fly home again. We make it through the passport control, and here’s the view from our plane towards downtown Dubai, just after take-off. A lot can be said about this city, but speaking from a purely architectural point of view, it’s certainly impressive. 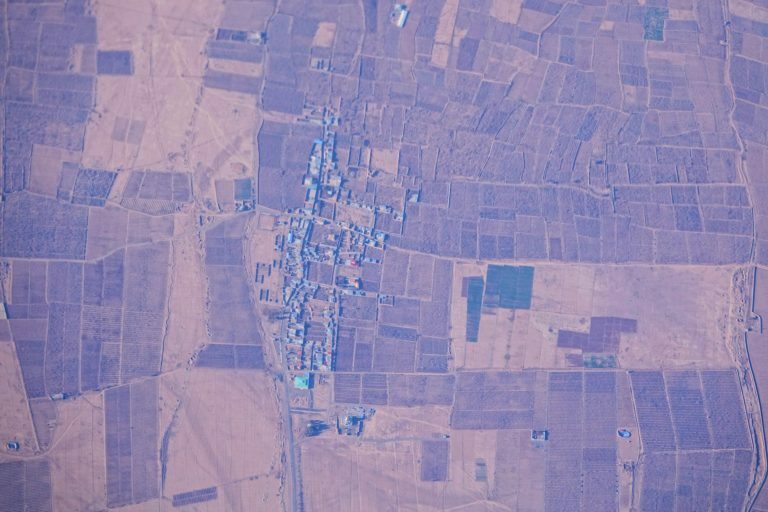 There’s an enormous contrast between Dubai and the villages in Iran that we fly over just twenty minutes later. I guarantee you that there’s not a single piece of marble on the mosque at the lower end of this settlement. When it comes to natural wonders, however, Iran is far superior to the United Arab Emirates. 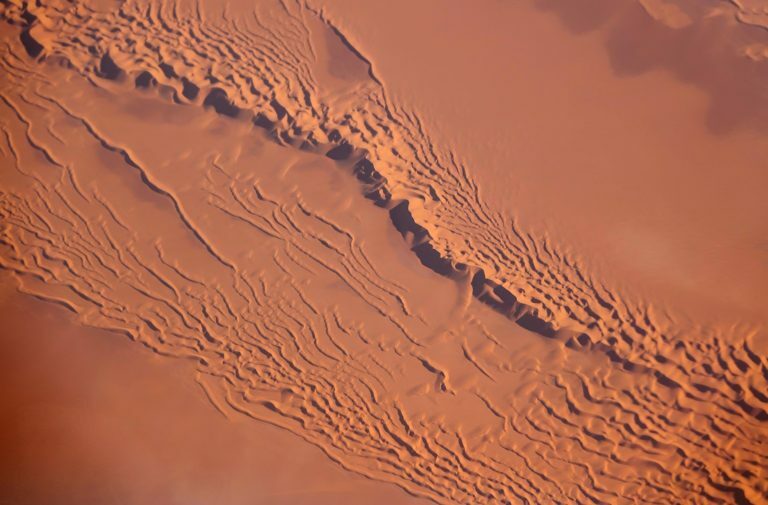 Here’s a mountain, delicious eroding in ultra-slow motion. 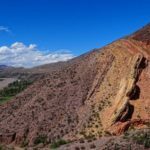 Rain and wind create the many veins that trickle down from the mountain and into the surrounding desert. Make sure you get a window seat for any flight over Iran. A short while later we cross the Dasht-e Kavir desert, and it’s all dunes below us. They slowly move across the landscape as if it was a frozen brownish ocean. 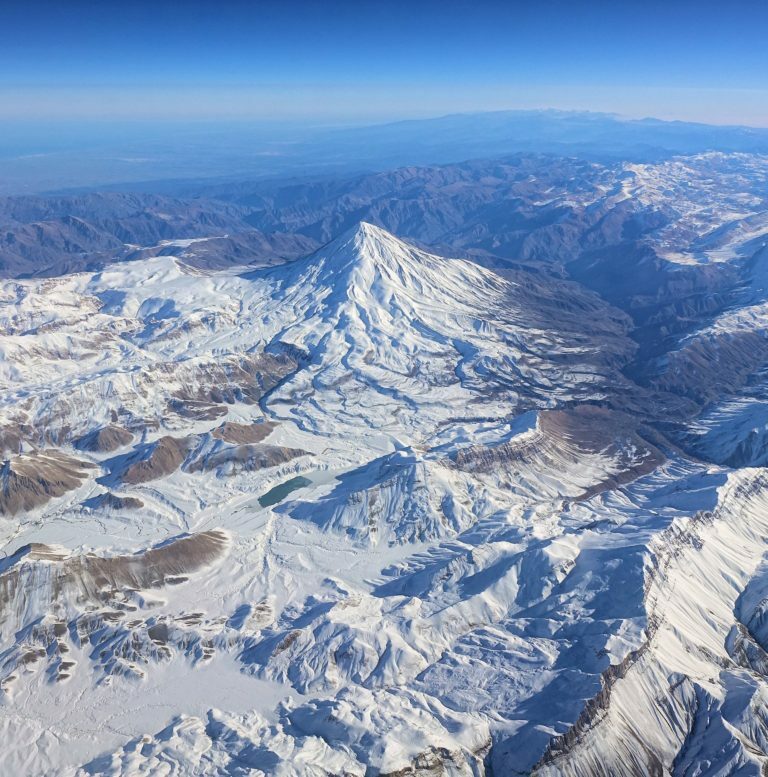 And finally, here’s the highest mountain in Iran, Damavand, an enchanting dormant volcano. 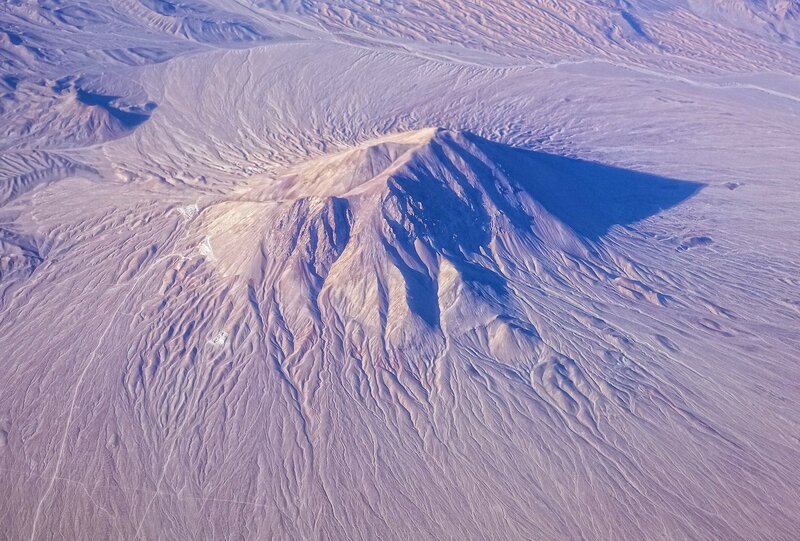 Don’t you just wish you could jump out of the plane and walk up to that beautiful peak? It’s actually a relatively easy hike. Just go to Tehran and drive to the starting point for the route up in a couple of hours. 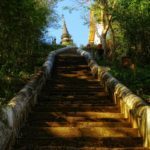 It takes 2-3 days to complete, so we’ll put that on the to-do-list for another trip. This snowy landscape is a nice transition for what awaits us at home in Norway. Six hours later I’m shoveling snow outside our house in Maura, as I try to find out where our car is buried. I soon wish I was back in Arabia. Just kidding. I’m definitely not. Thanks for tagging along on this photo journal. If you want to see the trip report from a visit to Dubai in 2015, here you go.